Garage Door Panel Repair or Replace? Your sectional roll-up garage door is composed of at least three hinged panels (usually steel, although some are wooden). Occasionally one of the panels may be damaged by a vehicle -- crrrrunnnch!!! Or weather, wind, and age may take their toll. If a panel or two of your home's garage door ends up looking less than its best, what should you do? Is it preferable to opt for a repair, or just replace the whole thing? Your decision will depend in part on the age of your door. The typical garage door life expectancy is 20-25 years. If yours is only, say, 10 years old, you may lean toward simply repairing the panel. However, unless you find a used piece for sale, you might have a hard time purchasing a single panel for an older door, since it must be similar in terms of weight and size as well as looks. What's more, changes in your door's appearance due to weather exposure will tend to make matching even more difficult (although painting is a possibility). The determining factor in your decision could well be the fact that garage door safety and energy-efficiency have been updated in recent years, with features like electronic eye sensors, pinch-resistant doors, automatic reversing mechanisms, and high quality insulation. Planning to sell? Full garage door replacement is the most esthetic option, and best for your home's curb appeal. Another factor is the cause of the damage. Normal wear and tear can produce minor cosmetic blemishes such as small scratches, dents, rust patches, cracks, or warps. Consult with a professional to assess the seriousness and see whether the problem is confined to just one of the panels. If so, it may be possible to repair your garage door panel with wood filler, paint, and/or a strut. On the other hand, if the door was struck by a car, someone tried to use the automatic opener when the door was locked, or your garage was hit by a hurricane or earthquake, the damage may affect much more than the individual panel and could threaten the safety of anyone using your garage. Essential mechanisms including the struts, track, spring, or opener may have been compromised, even if the damage is not apparent. One indication of damage is difficulty closing the door even though you are able to open it normally. Panel repair is one of the more expensive garage door fixes. The cost to repair your garage door panel is likely to depend on the serviceperson's hourly rate. One hour's wages is the usual minimum charge, plus any materials, of course. Installation of a new panel starts at $250 for the simplest 9' panel, up to a high of $700 or more for a more elaborate 16' panel. Compare this to garage door replacement cost which, including labor and supplies will run you about $1000. Check what is covered by your warranty, get price estimates, and decide which solution is the most cost-effective. When weighing costs and benefits, remember that safety is paramount. 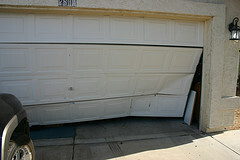 If there is any kind of damage, do not continue to open and close your garage until you can repair or replace the door. Even a minor garage door panel repair can become more serious if you don't take care of it promptly. For example, a small dent may lead to cracking, which in turn will permit water penetration and rusting. You might end up having to completely replace a neglected garage door ... and that's the best-case scenario. At worst, you could be putting your home at risk of burglary via the garage entrance or even endangering your family's wellbeing. Last but not least, check whether garage door replacement is governed by your local building code.